This Grand Beach House is ideal for a vacation getaway. Grand Beach has many amenities just a short golf cart away. A 4 passenger golf cart is complimentary. The home is located high on a wooded dune which offers you the seclusion and privacy for relaxation. 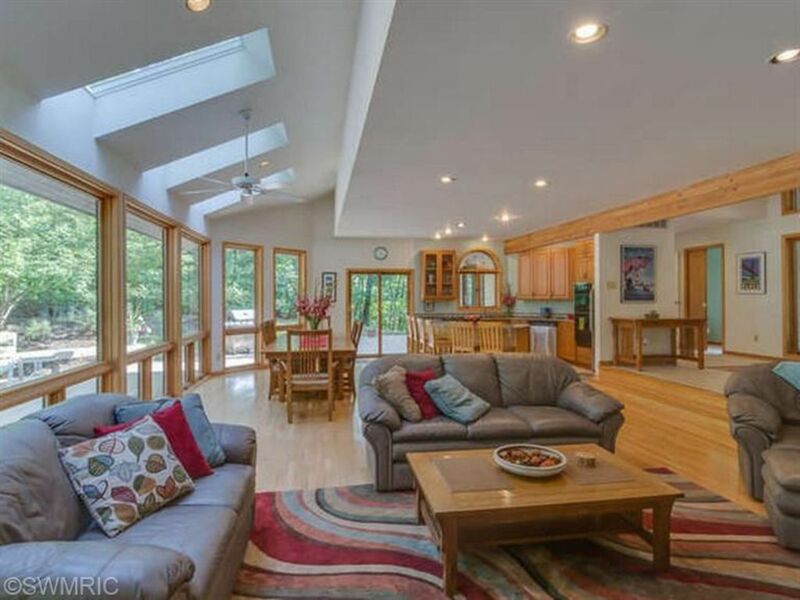 The open concept with walls of windows and large deck overlooks the woods. There is also a comfortable screened porch which is great to spend summer evenings. In the Village of Grand Beach, there is a playground, golf course, basketball court, volley ball court and tennis courts. The surrounding area has many available activities. New Buffalo, MI, which is 3 miles away, is a quaint town with unique shoppes and great restaurants. Michigan City, IN, is 8 miles away, has a lakefront park with summertime activities, zoo, large outlet mall and many restaurants. You could also tour the Barker Mansion, Old Lighthouse Museum, and International Friendship Gardens. Further Details: Further away is Indiana Dunes State Park, Warren Dunes State park and many antique shoppes and restaurants. There are also two casinos within a few miles. In Michigan City there is Blue Chip Casino and in New Buffalo there is Four Winds casino. Outdoor activities: Boating, swimming, biking, hiking, golf, tennis, basketball, miniature golf etc. About The Owner: My husband and I have lived in the Village of Grand Beach for over 28 years. We enjoy the people and peacefulness of a small community. As sailors for over 40 years, we love Lake Michigan and it's beaches. The beauty of nature is all around us in Harbor Country. Jetted 6' Tub in master bath and 5' jetted tub in upstairs bath. Grand Beach Small beach approximately 10 minute golf cart ride away. New Buffalo, MI Beach 3 miles, Michigan City, IN Beach 8 miles. Six to eight cars in the driveway. Houses golf cart, beach toys, beach chairs and cooler. Kitchen is fully equipped with dishes and utensils. Wooded lot on a dune. There is no grass but large wrap around deck. Very large wrap around deck with lawn furniture. Grand Beach has a 9 hole golf course. There is a golf car for your use at the home. Screened Porch, complimentary 4 passenger Golf Cart. Gas Fireplace. Grand Beach is a beautiful and well-furnished home. Linda is a great host with plenty of signs/directions to make sure you know how everything works and have everything you need for your stay. The house is also very clean and well maintained. We had 8 people and there was plenty of room to all watch the games together, or split up and do our own thing. The futons downstairs were comfy for watching the bowl games on the 60-inch. We did a lot of cooking over New Years Eve and Day and the kitchen had everything we needed. What a great stay – Friends, Family, Food and Fun. The reviews were right and honestly you have to see it in person to believe it, this house is warm and very clean! The host Linda was so gracious with answering questions and providing us with things we never even thought about that we would need. My family of 12 stayed here and we had the most amazing thanksgiving memories. There are so many rooms to enjoy here with amazing views at every turn and I especially loved all of the decks surrounding the property! The layout of the house is such that if you want to be a part of the group, you can, but if you want privacy too, you can have that as well. The kids had the most amazing time as well with the games that were provided. After doing extensive research on where we should all stay I feel lucky that I chose this house. Trust me if you’re reading this, you will not be disappointed! We are already looking at our schedules to see if we can come back in the summer!!!! This town and home are charming and I can’t imagine what it would be like in the summer! 12 members of our extended family (from Chicago, Wisconsin, and Florida) spent the weekend celebrating my sister-in-law's birthday. I was "in charge" of finding the perfect home away from home in Michigan that was not a long trip from Chicago, so I was anxious to see if my choice would get a first rate review. YES! Arriving at this home, we found that the gorgeous pictures of the huge, open rooms with large glass windows looking out to autumn woods was just as pretty (if not prettier) in person! There were several separate living spaces, so those people who wanted to enjoy the cocktail hour listening to music and visiting could be in one room while the other half were able to set up and play a friendly board game without being disturbed. The house was extremely clean, beautifully decorated, and included everyday household items for use so we didn't have to be worried about bringing our own kitchen gadgets or other amenities. I would definitely recommend this house as an excellent place to escape for both young and not-so young families!! It was the perfect place for our needs. We had extended family coming for a funeral. We had a choice of 5 lousy hotel rooms or this beautiful home (for less total money). We had 9 family members stay for 5 days and hosted a Thanksgiving dinner for 20. Linda was so gracious in letting us know that the home had the kitchen that could handle this. She above and beyond by having a roasting pan and electric carving knife on the counter, waiting for us. When we first walked through the door, we could see through the great room, across the deck to 2 deer standing ther, presumably to greet us. This was the best way possible for us to celebrate our loved one's life. Thank you Linda. Thanks Linda. I’m glad you felt home in our house. I’m sure “our deer friends” made it express special. They come almost every day for a visit. Great for our group! Loved the spacious great room! Great home for our purposes. Loved the setting and privacy. Well equipped. Spacious home. Really enjoyed the great room. Our favorite of homes we have been renting last few years. Would have loved to have more beach chairs available. Golf cart was great. Only complaint is the nearby beach was rocky and small. Won’t be going to that beach again. Looks like the nice beach will be a 15 min drive (I have not verified that; someone in our group said this) which is a bit of a bummer but this house is worth it! Took an evening golf cart drive to explore the area and it is positively beautiful! Thank you for a wonderful stay. The beach in New Buffalo is 3 miles away. I’m glad you enjoyed our home! 3 Mi to New Buffalo, MI / 8 Mi to Michigan City, IN. Grand Beach has a park with a playgound, tennis courts, basketball court, and volleyball court. It also has a golf course. All are easily accessible by golf cart. There are two casinos. One in New Buffalo, Four Winds and one in Michigan City, In, Blue Chip. There are no payment refunds, unless after cancelation, owner is able to book another guest for the original dates reserved. 2 night minimum Apr 30 to Jun 21, 7 night minimum June 22 to Aug 30, 3 night minimum Aug 31 to Sept 3, 2 night minimum Sept 3 to Nov 21, 3 night minimum Nov 22 to Nov 25, 2018.